Not to be confused with Mount Olive-Silverstone-Jamestown. St. James Town (sometimes misspelled St. Jamestown) is a neighbourhood of Toronto, Ontario, Canada. It lies in the northeast corner of the downtown area. The neighbourhood covers the area bounded by Jarvis Street to the west, Bloor Street East to the north, Parliament Street to the east, and Wellesley Street East to the south. St. James Town is the largest high-rise community in Canada. It has been identified as one of 13 economically deprived neighbourhoods within the city. It consists of 19 high-rise buildings (14 to 32 stories). These residential towers were built in the 1960s. Officially, approximately 17,000 people live in the neighbourhood's 19 apartment towers and 4 low rise buildings, making it one of Canada's most densely populated communities. St. James Town began to grow in the 19th century when it became a semi-suburban area home to the city's middle class. 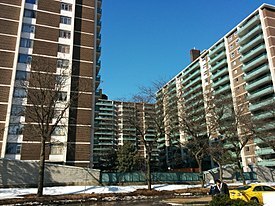 Many of St. James Town's highrises were originally designed after the Second World War, inspired by Le Corbusier's towers in the park concept. St. James Ward was rezoned in the 1950s, and the nineteenth century homes were leveled, and apartment towers — inspired by Le Corbusier's Towers in the Park concept — were erected. Each tower, which were named after major Canadian cities, accommodated thousands of residents surrounded by green space, but with few amenities. The 14 story Quebec was completed in 1959, the 18 story Victoria in 1965, and The Toronto's 24 floors in 1967. In the same census time period (1961 - 1971) St. James Town's population exploded to 11,462 from only 862. In the late 1960s, the developers attempted to acquire land south of Wellesley, as far as Carlton Street, to expand the St. James Town development. Many residents of the area resisted, with the support of civic activist and future Mayor of Toronto John Sewell. The St. James Town expansion was cancelled, and the homes that had been demolished were replaced with several housing cooperatives. St. James Town's highrises were originally designed after the Second World War to house young "swinging single" middle class residents. This plan was spurred forward by the federal government, that saw city building as a key to post-depression, post-war, nation's recovery. The apartments lacked appeal though, poorly constructed, and with a lack of amenities to support the density spike; many prospective tenants instead moved to suburban houses in the developing areas of Scarborough, Etobicoke and North York. The area quickly became much poorer. 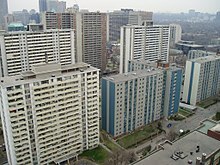 Four buildings were later built by the province to provide public housing. Today, the towers are mostly home to newly arrived immigrant families, with only 33% being born in Canada, according to the 2011 Census. In 2001, a new Toronto Public Library branch and community centre was opened in St. James Town. 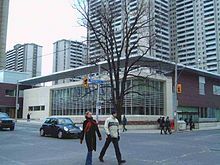 In 2001, the City of Toronto launched a major initiative to improve the area, including the construction of a new Toronto Public Library branch and community centre, which opened in 2004 at the corner of Sherbourne and Wellesley. Lanterra Developments has also proposed plans to replace some of the remaining Victorian homes in St. Jamestown with several more towers. On September 24, 2010, a fire broke out on the 24th floor of 200 Wellesley St East (the white building behind the library and community centre). Fourteen people were taken to hospital due to injuries, including three firefighters and two children; three of the injuries were classed as serious. The cause of the fire was determined to be a cigarette thrown from a balcony above. In 2013, St. James Town became the host of the World's Tallest Mural, pending approval by Guinness. On August 21, 2018, a fire broke out in an electrical box at 650 Parliament St. Only two people suffered minor injuries, but the entire building, containing 1,500 or more people, had to be evacuated. It took six hours to douse the flames. Reports indicated that evacuees would have to wait "several days" before they would be allowed to return. The diversity of the neighbourhood can be further supported by the fact that in 2011, 59% of the population identified as an immigrant. An immigrant is one who is citizen of Canada and has moved to Canada from somewhere else. 8% of the population identified as non-permanent residents and 33% identified as non-immigrants. In terms of the 2011 National Household Survey, there was Global Non-Response rate of 21.7% which means that only 25.8% of the population completed the survey. This number is actually higher than the 20% response rate of the 2006 Long Form census, however due to the voluntary nature of the census, the data is not as reliable compared to the mandatory long form census of 2006. This is because when it is a voluntary census rather one required by law, there is a high chance of non-response bias especially as the GNR grows larger which means that there is a higher chance that those who are responding to the voluntary survey is not completely randomized. In comparison to Canada, which has a GNR of 26.1%, and Ontario, which has a GNR of 27.1%, CT5350065.0 has a lower GNR rate which that there may be less of a non-response bias. According to the 2006 long form census and the 2011 National Household Survey the majority of individuals in St. James Town (census tract 5350065.00) would be categorized as being of first generation status (Statistics Canada, 2006; Statistics Canada, 2011). First generation status applies to people who were born outside of Canada (Statistics Canada, 2011). Second generation refers to people born in Canada but their mother and father were born outside of Canada (Statistics Canada, 2011). The final category, third generation and more, covers people who were born and Canada and both their mother and father were also born in Canada (Statistics Canada, 2011). The following is a breakdown of the percentages of those considered first, second, and third generation or more in St. James Town in both 2006 and 2011. From 2006 to 2011 the biggest change in the generation status occurred in the second-generation category where those considered second generation rose 12% from 8% to 20%. This indicates that individuals that were born in Canada with a mother or father born outside of Canada increased from 2006 to 2011. First generation status, on the other hand, decreased (despite still containing the majority of the population both years) and those considered third generation and more decreased by 1%. It can therefore be concluded that the majority of people living in St. James Town were not born in Canada according to both the 2006 long form census (where they accounted for 78% of those who completed the survey) and the 2011 National Household Survey (where they accounted for 67% of those who completed the survey). This information can be related to previously mentioned data on income and immigration status and diversity. It is to be noted that in 2006 the long form census had a 20% completion rate compared to the 2011 National Household Survey, which had a 25.85% completion rate. Therefore, more people completed the survey in 2011 compared to 2006, but as previously mentioned, one must be aware of a possibility of a non-response bias, meaning those answering the survey might not be random and may have affected the data. In 2006, there was a total of 14, 666 residents in St. James Town. Of this population, 14, 606 identified themselves as an immigrant. In 2011 (Global Non-Response Rate: 21.7)* (Statistics Canada, 2006; Statistics Canada, 2011)., the population dropped by 632 people to 13, 974 people (Statistics Canada, 2006; Statistics Canada, 2011). Of this population 8,180 stated that they were immigrants on the census. Although there was not a significant drop in population there was a significant drop of 6, 426 immigrants that no longer live in the area according to the 2006 long census form survey and 2011 National Household Survey (Statistics Canada, 2006; Statistics Canada, 2011). A corner store in St. James Town. a Food Basics at Ontario Street and Wellesley Street East. Previously, a No Frills had also operated at Sherbourne Street and Earl Street, but the grocer lost its lease effective as of July 2013. Signage on the store informs passersby that a FreshCo will open in the location, but no information on its opening date has been announced. In October 2015, the owner of the No Frills formerly located on Sherbourne Street reopened a new store two blocks away at the Greenwin Plaza shopping center located at 345 Bloor Street East. The St. James Town Youth Council, a body of community youth who meet regularly to address issues in their community. Currently, they host an annual talent show called "Urban Flair" featuring performances by local youth. This competition allows members of the community to support each other and provides an opportunity for new and upcoming stars to take to the stage. The St. Jamestown Community Cafe was launched in 2011. This pay-what-you-can cafe hopes to find a permanent home and establish Toronto's first community powered PWYC eating establishment while also providing a place for community members to interact and be entertained. The cafe founders also hope to provide an incubator for other community organizations interested in developing and establishing their own neighbourhood's version of a community powered pwyc cafe. Wikimedia Commons has media related to St. James Town. ^ Fun with the Census: Where’s the densest place in North America? ^ "Statistics Canada." Government of Canada, Statistics Canada. Web. Accessed 31 Mar. 2014. ^ Powell, Betsy (30 September 2013). "200 Wellesley St. fire: 600 tenants to share in $4.85M compensation". The Toronto Star. Archived from the original on 1 October 2013. Retrieved 1 October 2013. The fire, which caused more than $1 million in damage, broke out Sept. 24, 2010, in a 24th floor unit, after a discarded cigarette landed on a balcony filled with an “excessive amount of combustible materials,” according to the Office of the Fire Marshal. ^ "Toronto teens and artists create what could be world's tallest mural". CBC News. Retrieved 25 November 2013. ^ Bañares, Ilya (21 August 2018). "Six-alarm fire in St. James Town forces hundreds to evacuate". The Toronto Star. Retrieved 22 August 2018. ^ "Residents displaced by Parliament Street blaze not likely to return home for several days". CBC News. Retrieved 22 August 2018.